Chitrakoot is an enchanting place located in the Satna district of Madhya Pradesh, India. It's a perfect blend of religious, historical, cultural, and archaeological importance. The city falls in the northern Vindhya Range of mountains, sprawled over the states of Uttar Pradesh and Madhya Pradesh. It's the hill of many wonders that nestles calmly in the northern urge of Vindhyas. Famous for its scenic beauty and holiness, Chitrakoot is considered to be one of the most significant centres of Hindu faith and culture. With plenty of pilgrimage attractions like Kamadgiri, Ram Ghat, Sati Anusuya Ashram; Chitrakoot marks as an ideal spot for travellers. As per Hindu mythology and the epic Ramayana, the holy place holds major importance as it was the place where Bharata, the younger brother of Lord Rama came to visit Ram and asked him to come back to Ayodhya. Also, it is said that the Brahma, Vishnu and Shiva took embodiments here. It's a place where Goswami Tulsidas spent his many years of his beautiful life. To sum it up, the city is a perfect amalgamation of serenity, divinity and exquisite beauty. It is believed that Lord Rama and Sita have spent eleven years in these forests during their fourteen years of exile. It is said that Great sages Sati Anusuya and Atri did meditation at Chitrakoot. It's a sacred place where a number of devotees visit round the year. 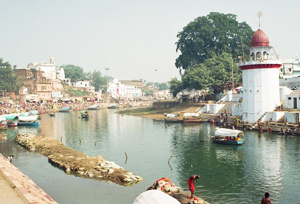 Explore Ramghat at the bank of Mandakini River in the evening where pilgrims are found floating mud candles into the river and Saints in deep meditation. Go to see a place of prime religious importance i.e Kamadgiri, which is bordered by a chain of temples and considered as the holy incarnation of Rama. Bharat Milap is also a beautiful attraction in Chitrakoot to explore, which is supposed to be the land of popular Rama and Bharata meet held in history. Janai Kund is another unmissable attraction in Chitrakoot which is located in the opposite direction from the Ramghat where it's aforesaid that Sita took bath in the pristine water of Mandakini during her exile from the Rama. While visiting any beautiful destination like Chitrakoot, all desire for luxury accommodation to enjoy holiday with peace. That's what Chitrakoot brings for its tourists. There are plenty of accommodation options in Chitrakoot ranging from mid-range hotels to budget hotels. All the hotels are well-appointed and fitted out with all modern amenities. Shopping in Chitrakoot is a delight for any tourist. After completing the sightseeing tour, it's important to take some memories from here. So, you my do little bit of shopping in Chitrakoot as there are many shops and local markets from where you can buy souvenirs and other handicraft items for your dear ones or for yourself. By Air: The nearest airport is at Khajuraho (170 Km), which takes three and half hours to reach Chitrakoot. Other options are Varanasi Airport (270 Km), and Jabalpur Airport (300 Km). By Rail: Chitrakoot Dham Karwi Railway Station is the nearest railhead which is located at the distance of 10 Km from Chitrakoot. By Road: There are several state government and private buses that ply from various cities to Chitrakoot like Allahabad, Panna, Banda, Satna, etc.